Spectrum crowding issues began almost as soon as wireless communications was started. Early spark transmitters spewed RF radiation all over the place, and (nearly) filterless receivers picked it up to convert the simple CW (continuous wave) signals into dits and dahs from Morse code messages. 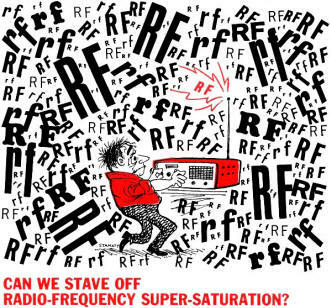 As more people climbed onto the radio bandwagon with ever increasing transmitter power levels and receiver sensitivity levels, differentiating between desirable and undesirable signals became a frustrating task - like trying to hold a conversation in a room full of yakking people. Filters on transmitters and receivers provided much relief. User numbers continued to grow and phone (voice) communications, which occupies a few kilohertz of bandwidth instead of only a hundred or so Hz, started straining spectrum availability again. Newer modulation techniques like single sideband freed up some space, but then the digital age came along and started sucking up spectrum yet again. During the entire time, advances in electronic components and circuit design (particularly filtering) continually expanded usable frequencies higher and higher into the GHz realm, but like gas expanding to fill the available volume, uses for and the resulting occupations of the RF spectrum never gets a break. Unquestionably the largest single contributor to easing spectrum crowding are spread spectrum digital techniques. WiFi, Bluetooth, wireless security, and cellphones would never work acceptably without it. My lifelong hobby of flying model aircraft has benefitted immeasurably from spread spectrum techniques by having virtually eliminated frequency contention issues that all too often caused airborne planes to crash when some moron nearby switched on his transmitter without making sure nobody else was using the assigned frequency (previous radio control systems used AM and FM pulse coded modulation on discrete 72 MHz channels). 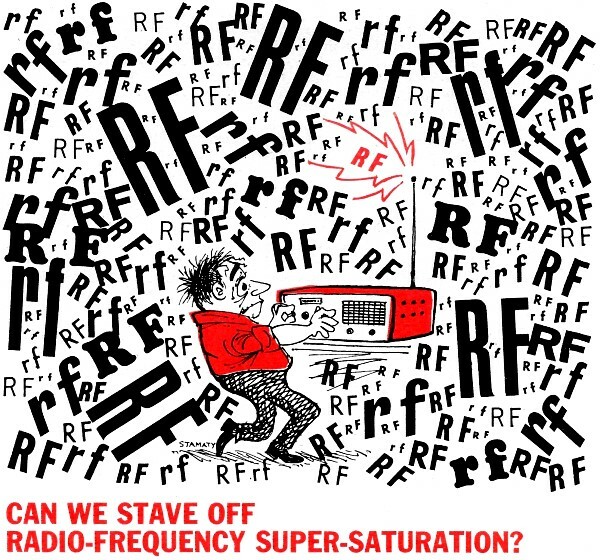 North America is Rapidly Running Out of Usable Radio Frequencies - How Did it Happen? Users of two-way radio communications facilities have looked with horror upon the congestion and glut on the 23 Citizens Band channels. Many users take the viewpoint that this congestion may be a warning of things to come on all two-way radio channels. It is becoming increasingly apparent that there are a lot of people using two-way radio and just as many wanting to get on the air as soon as they can. Radio users in North America are not the only ones concerned. Two-way radio usage in Europe and South America is increasing at an astonishing rate. All users are being made to face up to the fact that the radio frequency spectrum is fast approaching the super-saturation point. In New York City, a realty concern was forced to give up its two-way radio communications system because, "We could never get through to each other due to the congestion." The U.S. Coast Guard says that the marine calling and distress frequency (2182 kHz) is almost useless at certain times of the year because of the congestion and interference. Much of the two-way land mobile radio communications is now - out of sheer desperation - migrating to the more expensive (from an equipment viewpoint) UHF channels. CB'ers are making desultory moves toward a plan wherein they could acquire operating privileges in a portion of the 10-meter amateur radio band. 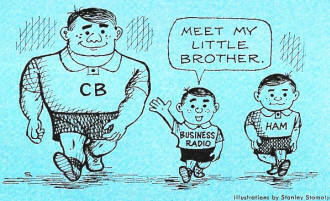 Actually, rumors abound that the FCC may eventually give CB'ers some portion of the 6-meter band. Law enforcement agencies, emergency services, fire departments, etc., are all pleading for more two-way radio fre­quencies. The major metropolitan areas (New York City, Los Angeles, etc.) must have more radio space or be strangled within the next few years by lack of radio communications. The aeronautical service is caught in a fantastic air traffic explosion, with more planes, more airline flights, more airports, etc., all demanding radio frequencies. The Federal Communications Commission is toying with the idea of channel splitting in the VHF/FM business band, which would effectively double the number of available frequencies, but is encountering opposition. Some halving of channel space is already afoot in England, however. "Land mobile radio in Britain," said J. R. Brinkley of Pye Telecommunications, Ltd., "is now embarking on the changeover to 12.5-kHz channel spacing." A few years ago the FCC attempted to break the communications log jam in the 2-3 MHz marine band through the creation of several channels in the VHF/FM band. As this is being written, channel-splitting in this new VHF band is expected to take place in a few months. Too Many Services. Many people aren't aware of the number and variety of FCC regulated radio communications services that are fighting for channel space. Each service has its own particular set of woes. 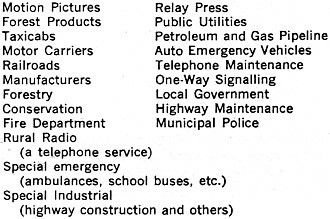 How many of the following radio services did you suspect even existed? Most of the services just listed are crowded into the VHF spectrum where they share (proportionately) a miniscule amount of frequency space in relation to the spectrum allocated for FM and TV broadcasting. The largest property owner in the radio frequency spectrum is the broadcast industry. It has the right to 82% of all non-government radio frequency allocations below 1000 MHz. In a span of only seven years (1958-1965), the number of licenses to broadcasting stations increased 60 %. Television broadcasting is a real frequency user. Each TV channel extends over a bandwidth of 6 MHz. Since the AM broadcasting band extends from, roughly, 550 to 1600 kHz, this means that each TV channel could contain almost six commercial AM broadcast bands! The Frequency Grabber. Although broadcasting appears to hold a disproportionate share of radio frequencies, the greatest frequency grabber is the U.S. Government! Roughly speaking, just about 47% of the radio frequency spectrum below 40,000 MHz is allocated to the U.S. Government! And only about 34% is placed under the control of the FCC for non-government use. Although the Government can find valid and sometimes justifiable reasons for some of its exceptional frequency allocation, the fact remains that somewhere along the line there must have been terrible mismanagement. When you tune from 2 to 50 MHz on any general-coverage communications receiver, you will find a lot of wasteland - vacant channels, misused channels and even redundant channels. To put it bluntly, the U.S. Government is nothing but a gigantic frequency hog! Although, privately, many Government officials admit that the situation is bad, few if any Government services want to give up - even temporarily - their radio channels. What Went Wrong? Most two-way radio communications users are unaware that more than 80% of our present facilities came into being after the close of World War II. From the 722 AM broadcast band stations on the air in 1939, and the 919 in 1945, the total now has reached an astonishing level of 4153! Commercial FM broadcasting stations grew from only 46 transmitters in 1945 to a grand total of 1744 in 1966. 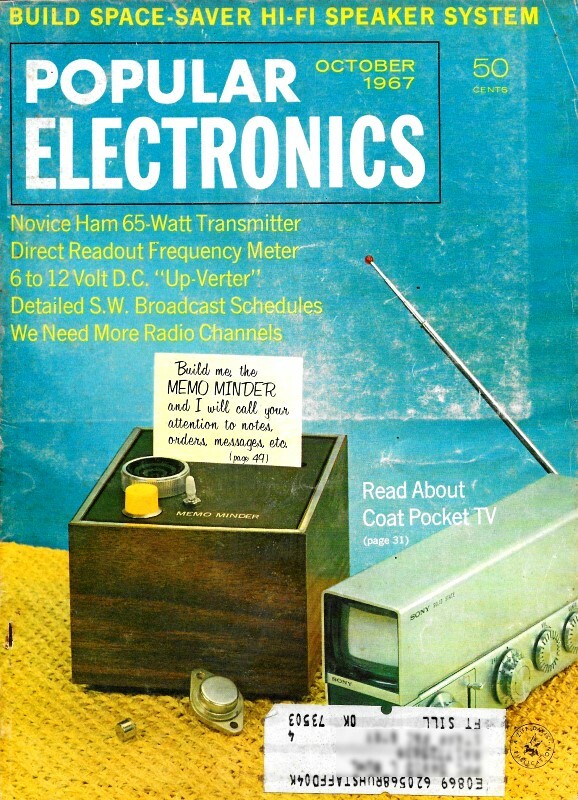 It is no small wonder, considering the number of transmitters in operation, that in 1964 the Joint Technical Advisory Committee of the IEEE told all those who would listen that all of our radio frequency space is in use and any major change would be difficult to make because of the great amount of money that has been invested. What Is Going to Happen? A few years ago, Irving Brownstein of the FCC staff said that communications is a world "where frequency cannibalism may be a major means of survival." In other words, if a radio service doesn't make sufficient and efficient use of their radio frequency allocations, they may wake up some morning and find that their channel is gone. Or, in a nutshell - "use it or lose it! " 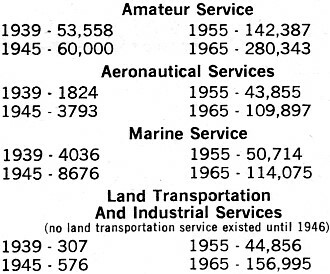 Right now might be a good time for all radio amateurs to take a look at their total frequency allocations. How many hams are using those 220-MHz-and-up bands? It is doubtful that the ham is in a very secure position as far as the use or lose philosophy is concerned. Powerful commercial interests are positive that they will secure frequency relief within the foreseeable future. The influential AT&T has asked for 78 channels for a public correspondence service; so far they have received only a piddling 18. The Ford Foundation has proposed a TV satellite relay system which might help pay for educational TV; although everyone admits that the idea is worthy, it's being opposed on the grounds that there's no frequency space available. And what might happen if the CB'ers ever did get organized and presented a united front to the FCC for more frequency space? Somewhere there is a solution to this problem of frequency strangulation. Whether it will be in the extension of the radio frequency spectrum or getting more out of what we already have is an interesting problem. A possibility - being very seriously discussed - is taking some radio services off the air. More than one "objectively-minded" engineer is aware that radio and TV broadcasting could be carried throughout this country by land coaxial cable or wire lines as well as by radio waves. One solution, with an eye towards unifying the fight against frequency poverty, is contained in a recent Department of Commerce report by a panel of non-government experts. * This panel recommended the creation of what might be called a "Super FCC." First, said the panel, this super-agency would find out who uses two-way radio communications and what they are used for. Then, all users would be ranked as to their importance to the national economy and how much their growth de­pended upon communications. This agency would judge who was doing the best job all the way down to who was doing the worst job. The Department of Commerce panel says coyly that it is "aware of the magnitude of the difficulties and complexities" facing such a group, but then adds that the agency would need a free hand. Interestingly enough, the panel also criticized the "radio smog" generated by wireless remote controls, wireless microphones, gadgets and toys, electronic appliances, electronic industrial heaters, and various types of medical equipment. In the early 1920's, well before these days of radio frequency congestion, glut, and smog, numerous radio experimenters claimed that they had received signals from outer space. There is always a chance that someone out there just might be listening to this mess. What will we do when "they" decide to speak to us by radio? Answer? Or, give them a citation for illegal transmissions? Somehow, this just doesn't seem to be a serious problem. With all the radio frequency congestion, it's doubtful that we'll hear them. * ''Electromagnetic Spectrum Utilization - The Silent Crisis", Telecommunications Science Panel of the Department of Commerce Technical Board.